Is it time for you to visit a proper opticians practice? Are you looking for honest and trustworthy advice about your eyes and sight from an Optometrist and Optician that understands your vision? Do your eyes deserve an exceptional examination? 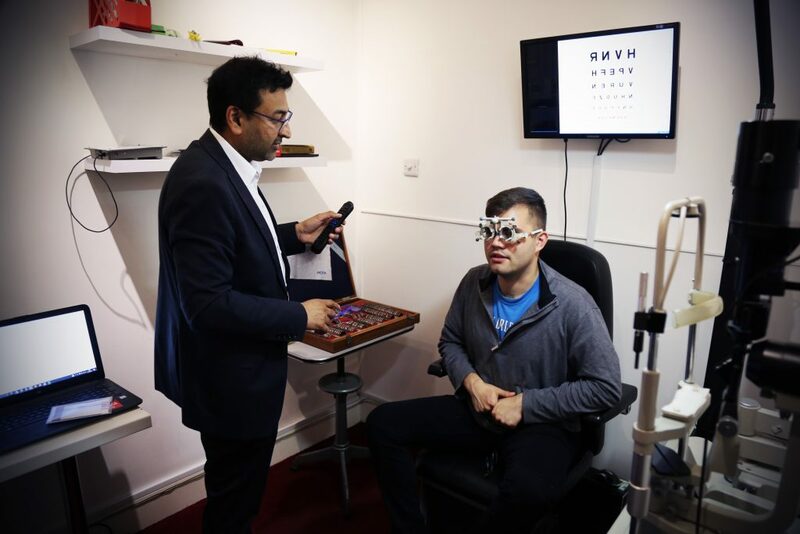 We’re multi-award winning opticians practice in Finchley, North London. We constantly strive to ensure that we listen to your concerns about your eyes and vision to guarantee that you have personal, truthful and uncompromised eye care that is centred around your needs. You can have peace of mind that your eyes and vision will be in the best hands. By using the latest cutting-edge examination equipment combined with decades of experience and knowledge, that is continually updated, we are committed to looking after you. If you're looking for the best independent Opticians near you, come and see the difference. Is it time for you to have a proper eye test? What are the most common difficulties that people come to see us about? Have you been having difficulties with your sight or vision? Are you feeling physical symptoms with your eyes? Are you concerned about cataracts, macula degeneration or glaucoma (especially if a family member has one or more of these)? Do you have any other concerns about your eyes or your sight? Is it time to update your glasses? I can see clearly, why do I need to have an eye test? What is the importance of having an regular routine eye test? What do you examine at an eye test? What happens at an eye or sight test? What is the difference in eye tests for adults vs children? How often should we have a routine eye test? What general health conditions can affect my eyes? What makes Central Vision Opticians different? Can you check my contact lenses at an eye test? I’ve heard that Central Vision Opticians has exclusive advanced technology to examine my eyes? Can you examine people who do not live in Finchley or in London? How do I make an appointment for an eye test? Perhaps it has been difficult to read words in a book or on your phone recently? Maybe it has been harder to see small writing further away such as on the board at school or college, in lecture theatre, on presentations, scores on the TV when watching football. Is your vision generally blurry? Are you experiencing eyestrain generally? Has one eye become significantly worse than the other? Have you recently started seeing floaters and/or flashing lights? Have you been experiencing pain or discomfort in your eyes? Are your eyes itchy and/or watery? An eye test goes way beyond testing your sight. Just because your vision is clear and you’re not feeling any symptoms like pain or redness, there are many conditions, such as glaucoma, that can cause people to lose their sight permanently and it can be prevented by an routine eye test. We can detect early signs of eye conditions before you notice them. An exam could also detect other general health problems. Good vision and healthy eyes help you work and play safely and comfortably. It leads to a better quality of life. You’ve only got one pair of eyes. If you lose your eyesight it may never be replaced. Unlike your teeth, your eyes do not usually hurt if there is something wrong. We check your sight and ensure that you have the best visual performance for any tasks that you do. In addition to reading an eye sight chart we may also check your peripheral vision. We examine the health of the front surface of the eye and the inside of the eye and the retina and optic nerves to look for diseases or anything that could threaten your sight. Our new pride and joy is our Optomap, our state-of-the-art ultra-wide retinal scanner. It allows us to give you a more thorough examination of your retina to identify problems early and protect your vision. We’ve made a brief video of a routine sight test at Central Vision Opticians. Since then we have introduced some more technology (especially our Optos Optomap machine) into the routine. Children and adults can have very different visual needs and can have a range of difficulties with their eyes that are related to age. The way the examination is conducted needs to adapted for every individual, especially for very young children. Children’s eyes are still developing until they reach 8-10 years of age (and sometimes even after that age) We specialise in examining if their visual developmental milestones have been met. We understand that children can often be daunted by the task of having an eye test, but we have special techniques and years of experience in putting them at their ease and making the entire experience enjoyable. The incidence in myopia (short-sightedness) is increasing in children at an alarming rate. We have been successful in slowing down the rate of change myopia in kids by offering the latest products and techniques. Children use their eyes intensely every day to learn and read, we are experts in assessing these crucial visual skills. Adults use their eyes for work and hobbies in a huge variety of ways. From office workers to gardeners, engineers to warehouse workers accountants to musicians. Each person has their own visual needs and we have experience of assessing all types. Just let us know when you book the appointment and we’ll be able to accommodate you. As we get older, we are more likely to be afflicted by diseases and age-related changes in the eyes. Especially, cataract, glaucoma and macula degeneration. We will ensure that these are examined in detail. Children with no symptoms or family history of hereditary eye problems need a sight test once a year. We usually see children from about 3 years of age, there are no concerns, but we can easily examine children from a few months of age. Children who need glasses need to be seen every 6 months to once a year depending on how quickly their eyes could change. After the age of 18, up to the age of 70, adults usually require an eye examination once every two years unless they are at the risk of complications, such as diabetes or a family history of glaucoma. Over the age 70 usually warrants an annual sight test because the health of the eyes is more likely to change quickly. After your test we will give you our expert recommendations. This includes advice about how to use your eyes effectively, looking after them to keep them healthy. We will advise you about most appropriate optical products and solutions for your vision. We have a complete and comprehensive range of solutions to help you see better and protect your eyes. As we’re independent opticians we are not limited to one or two suppliers. Unlike big companies, we are unrestricted and have access to the latest, best and most suitable products for you. Our mission is to raise people’s quality of life by helping them to improve their vision and to accomplish more. We are providing people with the tools to achieve their visual potential and to embrace upcoming opportunities. We are helping our customers to see the world, especially in a world where visual needs and demands are changing rapidly. Ultimately, we want to make sure that each of our customers will have the best possible vision for their entire life. At Central Vision Opticians we strive to give you peace of mind that you’ll achieve the best vision and achieve your highest visual performance through uncompromised and comprehensive eyecare using the latest, and best in class, equipment, knowledge, techniques, solutions and products. We promise to give you honest advice and offer amazing eyewear, the highest quality lenses and services that are right for you. We provide a unique range of services and products that are exclusive to Central Vision Opticians. Everything we do is guided by our mission, core values and promise to you. A routine sight test is £35, which is a small price to pay for looking after your eyes. We have the latest cutting edge technology, some of our technology is so exclusive it isn't even available to other opticians yet. We have been working with manufacturers, developers and researchers to bring this technology to you so we can give you a more comprehensive eye test and peace of mind. Of course, in fact we are recognised internationally as a centre of excellence for vision and eyes. We have patients who regularly visit us from all of the world including, India, Switzerland, Jordan, Quatar, Adu Dhabi, America and other countries.